We can expect more Galaxy S10 benchmark sightings going forward as we approach the official launch of this device. It’s just over a month away. Samsung will be announcing its new flagship in San Francisco on February 20. A Galaxy S10 model has now been spotted on the Geekbench website. It’s the model number SM-G973N, the Korean variant of the 6.1-inch Galaxy S10. 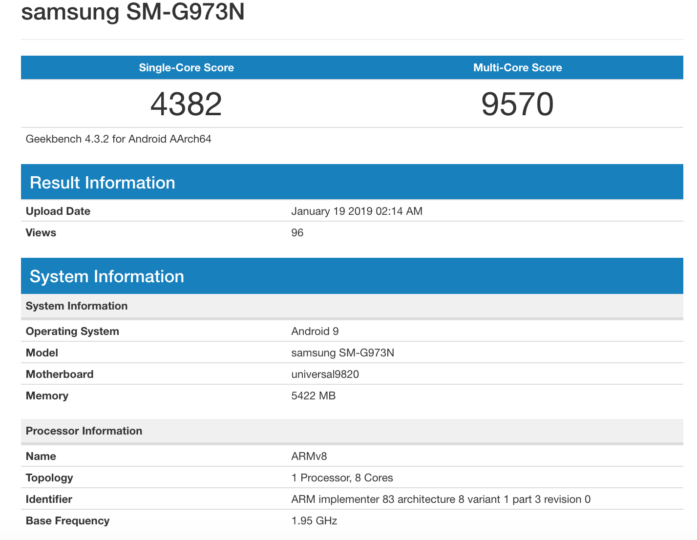 The 5.8-inch Galaxy S10 Lite surfaced on Geekbench a couple of weeks ago with 6GB of RAM. This Galaxy S10 benchmark listing suggests that the handset will come with at least 6GB of RAM. It most likely will, at least with the base model. Samsung might offer a configuration with more RAM and storage. The 6GB RAM will be paired with 128GB storage while Samsung may also offer 8GB of RAM with 512GB of storage. The Korean variant will obviously be powered by Samsung’s Exynos 9820 processor. The Galaxy S10 is going to run Android 9 Pie out of the box and that’s reflected in this listing as well. The device has 4,382 and 9,570 in single-core and multi-core scores, respectively. The figures are much better than the Galaxy S10 Lite benchmark which surfaced two weeks ago. It was the model number SM-G970U, the US-bound model with a Qualcomm Snapdragon 855 SoC. Samsung will be using the same chips across all variants so it was rightly chalked up as a case of unoptimized software. Even these scores should not be taken at face value with regards to the actual performance. Nevertheless, they do highlight what a difference unoptimized software can make. We’ve yet to see any benchmarks for models like the Galaxy S10 X which has 5G. It will likely surface on Geekbench in the coming days. It will be a shocker to see any variants of S10 flagship include lite models to have 4gb ram in 2019. Tbh it should have 8 as standard for the 10 and 10+. My note 9 ( exynos) scored 9168 multi core !! Posting 20 times won’t change the score. Will answer tho: yes, the exynos 9820 won’t be massively better than 9810 even by samsung’s own projections when they revealed it. Yes, most likely (again) the snapdragon will be massively better SOC. And yes, samsung should drop the double SOC variants as it’s not fair to pay actually more (1000€ is around 1140$) for inferior cpu/gpu/battery life/smoothness/etc. If they will do it or atleast catch up with qualcomm (apple is not even a question, they are far ahead even than qualcomm in SOCs), who knows, but won’t be this year. My note 9 scored 9168 multi core ! !